Max was said to be a hothead. When in Romania it was said he got into an argument with a man at the town’s open market. The argument was over a horse. Max got so at the man, he picked up a rock, hit the man and killed him. Max was a wanted man for the murder of that man and so Max fled with his family to the United States. 1) Jennie (Hebrew name: Shendel) Buried with Davis last name at Knesseth Israel Cemetery in Birmingham, AL (born in Romania in 1891- died May 5, 1947 (breast cancer) married Mr. Mendlecohn (also Mendlesohn). They divorced by the time their child was 4. 1a) Son of Jennie & Mr. Mendlecohn: Maurice Mendlecohn (or Mendlesohn) (born ? 1929 ish died 1951?) His mom is buried as Jennie Davis…found a grave at the same cemetery with a Maurice Davis…Born: Nov. 2 1907 and died Mar 14, 1952. Not sure if this is him. Maurice enlisted into airforce-was a pilot. married Rita (?) and had one son. 1b) Grandson of Jennie & Mr. Mendlecohn: Maurice, Jr. last name? (born 1953?) Rita (?) remarries and lived in Greensboro, NC? 2b) Grandson of Henry and Rose: Howard Davis (born 1954) married ? 5) Mathilda (born in New York 1905) married Ben Goltsman (born in Penn 1870) Had been married before with a child. Because of that during this time the family didn’t like. He also had no money and way to support Matilda. Ben sold a label of cheap wine in Montgomery, AL and became very wealthy. The company was called: Ben R. Goltsman Bottling Company Inc. It was established on July 1, 1952. File number 748-742. Address:145 COOSA STREET MONTGOMERY ALABAMA 36102. Ben’s son Larry took over the business and in 1963 tried to expand the business. Ben R. Goltsman Bottling Company, Inc. is a Florida Foreign Profit Corporation filed on August 1, 1963. The company’s filing status is listed as Inactive and its File Number is817249. The Registered Agent on file for this company is Standard Distributing Co. and is located at 375 North Ninth Avenue Pensacola, FL 32502. The company’s principal address is145 Coosa Street Montgomery Alabama, FL 36102 and its mailing address is 145 Coosa Street Montgomery Alabama36102. The company has 3 principals on record. The principals are Calvert,b W from Montgomery AL, James G Hawthorne from Montgomery AL, and Larry E Wallock from Montgomery AL. Ben and Matilda were well thought of in the Montgomery society. Ben also owned the baseball team. They had a chauffeur and maids. Was told that when Della died Lawrence went to live with Matilda. And when Jennie and her husband died Maurice too went to live with Matilda. Maurice goes into the airforce and returns safely. Ben buys him a plane. There is a wedding in Colorado. Maurice, Sidney and Larry were going to go on the plane. Larry got sick at the last minute and couldn’t go but Maurice and Sidney go. The plane crashes on their return trip and Maurice and Sidney are killed. Matilda was never the same after the accident. She drank heavily. They never divorced but lived in separate homes. No one forgave Ben for buying the plane. In Ben’s obituary it stated Larry was his adopted son. 6) Isadore (born in Alabama 1909 (1910?) died 3/12/04 ) married Rose Shugerman (born in Alabama 1910 (1909?) died 1/2/76 Former owner of Davis Produce Grocery along with brothers. 6b) Son of Isadore and Rose: Melvin (born 1940 or 1941?) married Jane (?) Children: Robert Michael (born 1973?) married Miriam (?) Isadora born ? 7) Dorothy (Hebrew name: Devorah) (born in Alabama) born: September 20, 1908 and died: October 31, 1953 married Walter I. Morris (Hebrew name: Zahav) (born: July 22, 1891 and died: April 27, 1960) Dorothy lived in a boarding house in 1930 at the age of 19 before getting married. No children. Newman captained the football at the University of Alabama in 1940 and was named third team All-SEC (Southeastern Conference) that season. In 1998, Harold was featured in an exhibit at the Museum of Southern Jewish Experience called Shalom Y’all: A Road Trip through Jewish Alabama. 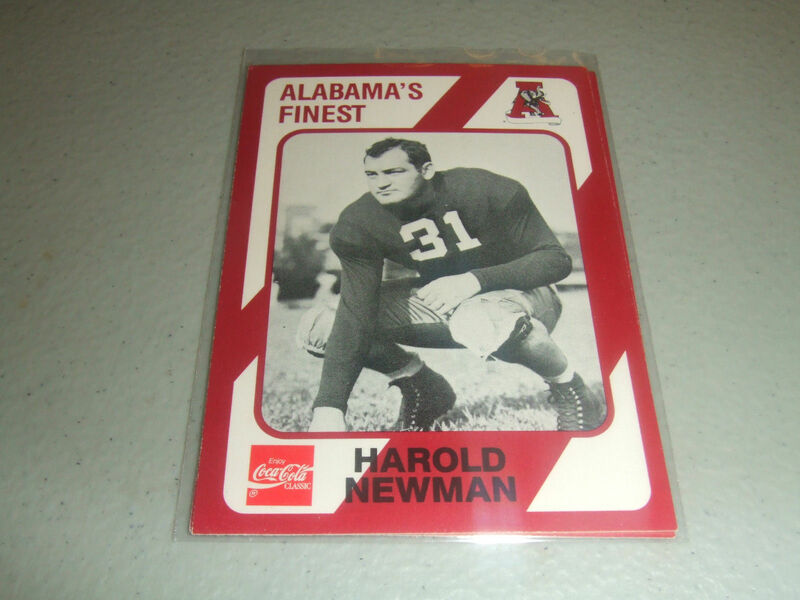 Born in Alabama, Newman attended Ramsey Technical High School in Birmingham where he was an all-city, county and state tackle his senior year (1935). Newman then attended the University of Alabama and redshirted in 1937, but was a member of the Tide’s Rose Bowl team that played on January 1, 1938 (he did not play). The following year, he started at right end in two games (playing in all games) as Alabama had a record of 7-1-1 and were ranked No. 13 in the country; their only loss came at the hands of No. 2 Tennessee, 13-0. The following season, Newman firmly established himself as a starter at end as Alabama finished 5-3-1. That year, he earned second team All-American honors and was named to the Birmingham Post All-SEC team. Alabama coach Frank Thomas called Newman “the best player in the South” and he was the Bama Cup recipient as the University’s most outstanding athlete for the 1939-40 year.As a senior in 1940, Newman was named captain and the Tide won their first three games of the year before losing to No. 4 Tennessee, 27-12 (it was Alabama’s third straight loss to Tennessee). The Tide then won their next four games before losing the final game of the year to No. 9 Mississippi State, 13-0. Alabama finished the season with a record of 7-2-0 and Newman was named All-Southeastern Conference third team despite playing much of the season injured. He also played in the 1940 Blue-Gray Game and started at end for the Grays. After graduating, Newman was drafted by, and contracted to ($165 per game), the Brooklyn Dodgers of the NFL football club for the 1941 season. Before he could play for the Dodgers, however, Newman was drafted into government service. During World War II, he was a co-captain of the Randolph Field (San Antonio, Texas) Ramblers, who went undefeated and untied and won the 1944 National Service Team championship – they also finished third in the Associated Press poll behind Army and Ohio State. Newman then appeared in the 1945 Poi Bowl held in Honolulu in a game that matched the U.S. Army Air Force All-stars vs. the U.S. Navy All-stars. He was later Athletic Officer at Ft. Belvior, Virginia in 1945-46. If you could contact me on any information it would be greatly appreciated. Oh wow. I do have a bunch of notes I wrote down after speaking to a couple of older couples who remember Della. I will certainly go back and look and get back with you. I am at work but went back on this site to read my notes. I just remembered a few things that I was told. Will still go back to see more detail info about Della that I have. But to be honest because she died so early many of the cousins still alive were just kids when they knew her. It was said Della died from breast cancer. (Three of Della’s sisters also had breast cancer.) It was said that the Davis’ were a bid odd. Della’s father Max was said to be a real character and not in a good way. Um, did your grandfather tell your dad any stories about when he was young? I know when Matilda took Lawrence in she treated him like a son. Matilda was very much a party girl and liked to drink. After her own son died she never was the same AND didn’t treat Lawrence very well. After all of those years treating him like a son, she cast him aside. I can’t imagine how that made him feel.